Rock legend Grant Hart (ex-Hüsker Dü and Nova Mob) will play what I believe to be his first ever show in Omaha on Thursday, June 30 at The Waiting Room. 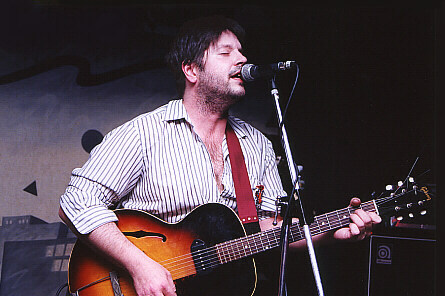 Hart, one of the two songwriters in legendary 80s band Hüsker Dü, has been recording sporadically since that band's demise in 1988. Hart began as a solo artist releasing albums for SST Records. His solo debut, Intolerance, remains a high water mark in his lengthy career. By the early 90s, he had formed a new band called Nova Mob. Hart gave up the drums and picked up the guitar for that band. It released two full-length albums and a number of singles before breaking up in the mid 90s. Hart then returned as a solo artist with the album, Ecce Homo, released in 1996. This album was followed by Good News For the Modern Man and his most recent, Hot Wax, from 2009. Both Hart and Nova Mob have appeared on compilations and soundtracks, as well. Though Grant Hart has not been in the spotlight as much as his former band mate, Bob Mould, his post Hüsker Dü material has always been met with critical acclaim. His music consistently challenges the listener, and continues to surprise and delight his many long-time fans. Personally, I have not seen Grant Hart since Nova Mob broke up. On that final Nova tour, Grant went back to playing drums, and it was one the best shows I saw that year. On the tour that brings Hart to Omaha, he will performing "solo electric," and performing songs from his entire career - including Hüsker Dü. Here is a video of a song called, "You're the Reflection of the Moon on the Water," from Hart's Hot Wax album.